In September 2009, we received an unusual report from our Lion Guardian Kamunu. His report was of a group of 4 male lions of the same age traversing through the Selenkay conservancy. We had never had such a big group of males traveling together so we gave instructions for them to be closely followed. We were able to see them briefly one afternoon, but unfortunately that night , they went on a killing spree, killing 7 donkeys as well as several shoats from one neighboring community. In the morning they were hunted, but due to the efforts of the Lion Guardians and the Eselenkei Game Scouts, no one got hurt and all lions lived to see another day. The next day we collared the biggest and called him Sikiria (meaning he of the donkeys). He then disappeared for 4 months. We gave instructions to our Lion Guardians to track him down but to no avail. We even conducted aerial searches without success! 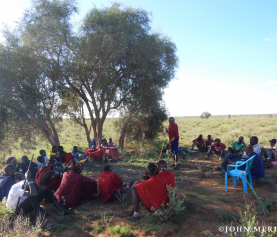 One day when we were following a report of a male lion called Lomunyak on Mbirikani Group Ranch, we did a call-in expecting Lomunyak to show up. We heard the approach of lions and when we shone the light, we saw 2 lions and to our utter surprise, it was Sikiria and his brother Oyayai. When we down loaded his GPS collar, we were completely baffled by his movement patterns. He had moved through Namanga, spending nearly two weeks up on Namanga Hill, then he went all the way to Torosei which borders Shompole briefly in to Tanzania and back to Eselenkei and over to Mbirikani! 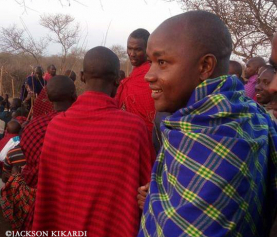 Shortly thereafter, he moved beyond the Chyulu hills to an area close to Tsavo West National Park, Kuku. On many occasions he killed livestock and was hunted. At one time in early 2011, he injured a young Moran who was with others, hunting Sikiria after he had killed a cow. Sikiria got away without a scratch. Over the past few years, he has matured, behaved well and finally settled in a place called Oltiasika mating with more than 6 females and siring over 9 cubs. His pride is composed of 14 lions and is thus one of the biggest lion groups that our Lion Guardian Project monitors outside protected areas. 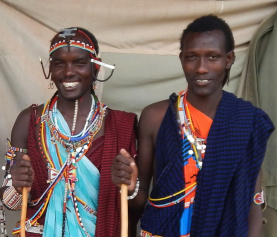 A few days ago, Sikiria, together with his brother and constant companion Oyayai, killed a cow at a place called Elang’ata Enkima on Kuku Group Ranch during the day. The cows were being herded by 3 Morans and when the Morans confronted these lions, Oyayai ran for his life but Sikiria waited for them. He was speared but in return he seriously injured 2 of the warriors while the 3rd ran home calling for reinforcements. Many Morans came to the rescue of their colleaques and speared Sikiria to death. But before he died, he seriously injured a 3rdMoran. All the injured Morans are currently recuperating at Loitokitok District hospital and we wish them quick recovery. According to the Maasai tradition, human injuries caused by any wildlife species is unforgivable and revenge is usually the ultimate response. Up until he finally met his fate, and upon downloading his movement patterns, Sikiria had travelled almost 7,000 square km, passing through 21 of the 30 Lion Guardian zones. As far as we can find, he has one of the largest documented ranges outside the desert lions of the Namib. Sikiria has always been a problem lion but our Lion Guardians in conjunction with other stakeholders within the Amboseli-Tsavo ecosystem like Maasailand Preservation Trust game scouts, Maasai Wilderness Conservation Trust and KWS –Amboselihave all contributed to his protection until he met his fate. He was well-known as a recent survey conducted in Lon Guardian areas showed. Over 70% of people in the surveyed areas could name at least one lion and Sikiria was the most frequently named; a lion legend. His prominent beauty, unique personality, and composure will always be missed by those who knew him. an amazing animal but i wished you had put a warning in the 3rd photo. it pains me to hear of such things when these majestic animals are killed, but even more so i don’t want to see the pictures of it. they cut off his paws?? horrible. just horrible. THank you for your advice Raven. We have added a warning. Am I right in understanding that whichever male lion takes over his territory will now kill the cubs and females of Sikiria’s pride? Oyayai is still in the area and with the pride, but should another male or males displace him, then yes, there is the possibility that some of the younger cubs could be killed. Lets keep our fingers crossed!